Harry Maguire has declared Raheem Sterling to be the best player in the Premier League this season and wants England fans to "cherish" the in-form Manchester City winger. 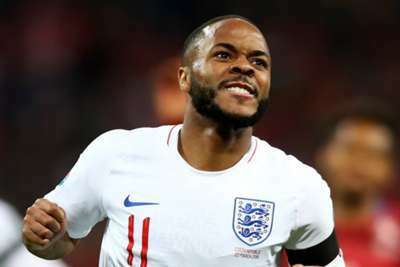 Sterling was the star turn for England against the Czech Republic on Friday, grabbing a hat-trick in a 5-0 triumph just two weeks after scoring all of City's goals in a 3-1 win over Watford. The 24-year-old has earned praise from Leicester City defender and international team-mate Maguire, who revealed Sterling received his vote for the PFA Players' Player of the Year award. "I think he's been the best player in the Premier League," Maguire told the media. "He's scoring goals, creating goals and he's a nightmare to play against. "He's taken his game from last year, where people saw the rise of Raheem, to this season where he has gone on to another level. "It's harsh in terms of the [PFA] voting in that at this stage you don't know who’s going to win the Premier League. But I went with Raheem. "It's an exciting time for the country to have him and we should cherish him and look after him while he's playing at such a high level. "Personally, I want to see him scoring goals week in, week out, and especially against teams around us, not against us!" England play Montenegro on Monday in another Euro 2020 qualifier and Maguire has high hopes for achieving success at the tournament after reaching the last four at the 2018 World Cup. "At the next tournament we'll want to go further," Maguire said. "I think we are the only semi-finalists of the World Cup teams to get through to the Nations League finals, so that shows the progress we are making. "There were comments after the World Cup that we didn't beat any of the top, world-class teams, so it was nice to be put in a group with teams like Croatia and Spain – arguably the most difficult one of all – and come out on top. "The improvement we've shown since Gareth has come in, and the style of football we're playing, it feels like everyone's excited to watch us. "But the main thing is winning games. We've got the summer to look forward to when we can win a trophy."